Beautiful hand jewelry to wear during performances. The EDEA Piano ICE is the Lightest Skating Boot available and represents a turning point in Skating and Skate Technology. The KEY NEW FEATURE of the EDEA PIANO is its patented shock absorption features. Every time a skater lands a jump, there is impact. The force of the impact depends on the weight of the skater and how the jump is landed. When a skater lands a jump, this force is estimated to be between 2 and 8 times the skaters actual body weight. This means that a skater weighing 75 lbs can land a jump with 600 lbs of force. This impact produces a shock wave, that moves up through the legs and the body. These waves increase force across the ankle, knee and hip and even the vertebrae. Stiffness Rating: 90. Lightweight version of the Risport RF1 model is designed for and worn by the World’s top competitive skaters. This boot is designed to support all triple and quadruple jumps while also providing a featherweight advantage to a traditional style boot. Padded back collar and premium aloe infused microfibre lining make this boot extraordinarily comfortable to wear. Lace loops and set back extra hooks keep everything secure and in place. State of the art thermoplastic sole with leather inset eliminates water damage. Available in AA, B and C widths. Available in White and Black. Please allow 1 centimeters from the end of the big toe to the end of the insole for growing room. BEFORE YOU BEGIN MEASURING - Risport is typically 1.5 size smaller than street shoe size. However, measurements are very important! Use these charts for finding your size in Risport ice skates. Risport is measured in centimeters. 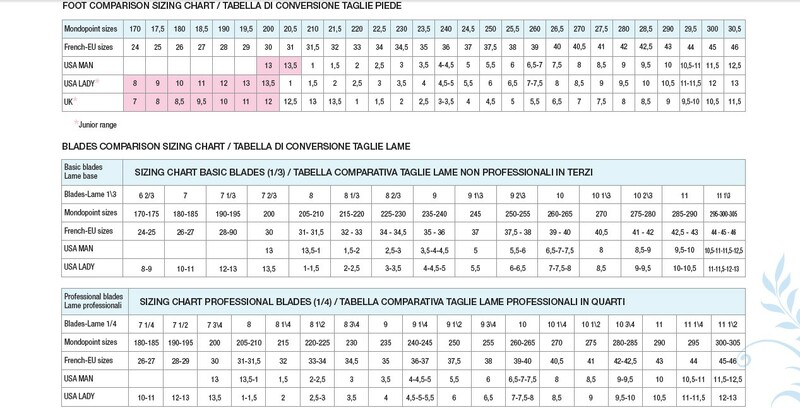 We have provided the measurements shown below to assist you in finding your correct size in a Risport figure skate. However, we are is not responsible for skates that have been sized incorrectly. These measurements should not be used for any other brand of figure or ice skate. Risport sizes their skates for a snug and proper fit. Growing feet: If skates are bought at the beginning of the season a 1 centimeter gap is usually sufficient to allow room to grow without affecting the training. Indeed by competition time at the business end of the season the skates will be perfectly adjusted. Place a ruler or tape measure on the ground (must be a flat surface, like tile or cement). Stand with all your weight on the foot you are measuring with your foot on the tape measure. Measure from your longest toe to the heel. Repeat this procedure for the other foot. Look at the charts below and find the measurement of your feet in the left column. If one foot is longer than the other, use the measurement of the longer foot. Note on sizing Risport: C width is medium. Feel free to email info@boutiquestepup.ca with any questions or concerns. *We try to have one of each sizes in stock however if the size needed is not in store please allow 1 to 2 week for ordering in. Please contact us to confirm. Top of the line boot for advanced skaters landing triples & quads. This is a strong boot that miraculously still allows for a flexible range of motion! Very lightweight in design to reduce fatigue & allow for extra height on jumps.